Think of a long pitch-black road and you are riding your smoothest motorcycle; a simple breeze and lonely roads will surely make your mind eager for music. A lot of hectic issues will come up too! Cause, your wired headphone does not set within the helmet. Moreover, changing the song and answering a phone call is another biggest challenge. This is the moment, while your heart is desperately searching for the most comfortable, best quality sound and durable headphone whose battery lasts pretty long to cover the journey. Dear friends, my today’s writing is to guide you on the shortest way to choose your best headphone from the market. Local markets are full of gimmicked products. Shopkeepers promise a lot during purchase but while you use them in real life they betray more often. Thus, we have two life-saving tips for you. Number one, read my blog! So, you will get the real-time user-based review. Because before writing you I or my friends have used them. Number two, purchase products from renowned online sites like Amazon.com; so, you can be assured of your quality, always. Before starting the whole topic, let us decide what we are considering as a user. We are considering you have your best motorcycle for which you are looking for a headphone. Surely, you want them for music at the very first sight. Also, you have demand for phone receiving facility. As we are only discussing Bluetooth based headphone, so this article may not be pretty satisfying for wired headphone users. But in today’s moving world everyone wants to be a hassle-free life. So, I guess mass moto riders are desperately searching for guideline on best motorcycle Bluetooth headset for Music. Let’s start with why you should look for a quality device and which are those? Easy to install in the helmet. One button changes the song or receives the phone. In good quality, headphone battery lasts pretty long. Battery recharge is a regular work which will add to your timeline. For some people is it boring. Very small in size. Easy to lose in hurry. You might need a specific model helmet to install your Bluetooth headphone. That might specify your choice on the model. Most often brands use one ear. It sometimes causes pain to that specific ear. Although point may be same to same If you prefer to be a smart hunk who is riding his ultimate beast on road to fire up the opponents; I would surely support Bluetooth headphones. They just not only give you style but also gives you freedom. So, Which Model is the Best Motorcycle Bluetooth Headset for Music? The marketplace is abundant with choices for the best Bluetooth headset. Among others, one that deserves your attention is the Sena 20S, which will be the subject of the rest of this short review. The Sena 20S is not just like any Bluetooth headset. One thing that makes it different from many others is the fact that it is an intercom system that is designed with the needs of bikers in mind. It is a motorcycle communication system that will help you to stay connected and entertained on the road while promoting your highest level of comfort. The manufacturer takes pride in having state-of-the-art features that have been sported for the first time in the industry. For instance, to guarantee its reliable performance, the Sena 20S the Bluetooth 4.1 technology. It is even made better by the dual Bluetooth communication module. It has high-definition audio, providing clarity that is hard to rival. Looking at its advanced features, another thing that will captivate your attention is the Audio Multitasking. This allows you to do more at once. With this feature, even during intercom conversations, you can still hear music or directions from the GPS. It has what is called the Overlay Sensitivity Mode, which will basically allow you to adjust the volume on the background. When listing all of the good things about the Sena 20S, one thing that should be mentioned is the clarity of the audio, especially when you use it as an intercom. This way, you can always clearly hear the person on the other side. The HD-quality voice will redefine the way you communicate on the road. You can connect up to eight devices and expect that the voice quality will still be clear. Meanwhile, the maximum distance of the intercom function is 2 kilometers. To add, you can expect clarity of audio because of the Advanced Noise Cancelation technology. This comes handy for the effective suppression of wind noise, especially when you are riding at high speed. There is no need to worry about the user interface of Sena 20S. It is well-loved by its users because it is easy to use. With this Bluetooth headset, you can enjoy intuitive voice commands. This allows you to use it in hands-free mode, which is vital for your safety when riding a motorcycle. Pairing the Bluetooth headset will also be a snap. It has a motion sensor, which will allow you to pair it with another headset by just shaking it. Cardo is known as one of the best motorcycle friendly accessory manufacturers for bikers. From 2004, they have launched a number of brave models with unique technologies. Q-Solo is one of their finest presentations. Within basic features, Q- Solo can take you to the next level of audio experience. The user enjoys complete freedom of receiving phone calls. This phone first provided an experience of handsfree talking to mass people. Towards biker’s cardo is a trustworthy name. The feature that made this model best motorcycle Bluetooth headset for music, even you can use your voice to start, end or change music and even receive phone calls from the phone. So, no need to hands off from bike handle or steering at all. We all, often hear audio streaming while riding. But we also need GPS guide streaming too. Think of a headphone where you do not need to interrupt. Both audio streaming and GPS guideline can be played parallelly. You can listen to your FM channels, talk on the phone and also hear GPS instructions parallelly. Think two of your best friends using cardo headphones. They can be the same or different model. You guys can discuss anything through intercom without stopping. This is one of the most attractive features, I guess. You can use the iPhone to control headphone as remote with the help of very easy setup wizard. To support you in monsoon and also in your muddy racing track, this headphone is dustproof and waterproof. With Bluetooth 4.1, you can continue at least 13 hours uninterruptedly. The weight of 1.2 ounces also gave it an additional feature. They have a changeable boom for the mouthpiece. So, you can be comfortable and hygienic on this issue. It has wired microphone options as well. With Built-in FM and completely controllable sound option, Q-Solo is one of the best choices for any rider. 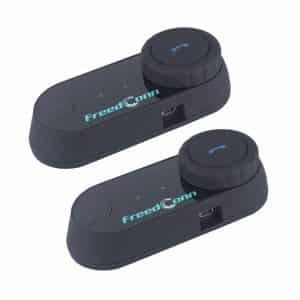 Freedcon brings you the smallest and easiest helmet usable headphone that can fulfill most of the common demands. If you have planned for moto skiing and want to use the intercom as well. This is the best choice. It comes with a pack of 2 as well. Within 800 meters, up to 03 users can be paired and enjoy their happy time. Most intercoms featured headphones have a common problem. They cannot give support when you are in high speed. But Freedconn promises smooth connection up to your speed 120Km per hour. Frequent communication between two comm device is also available in this headphone. Basic features like a hands-free cell phone are also available with this headset. So, it is ultimately protecting you for safe driving and returning to your loved ones peacefully. Although the Bluetooth version is pretty old. It is 3.0 but it can frequently search for pairing devices automatically. You can also plays quality music from your phone and keeps you connected with the phone. And it has stable Bluetooth GPS system which helps you to navigate as well. Very easy installation process makes this phone user-friendly. But no ISO version or Google play app is found. It has sun proof, waterproof features with tech type shape. On the safety issue, this headphone is FCC, CE and ROHS safe marked. In a full charge of four hours, you can enjoy ten hours of call or seven hours of intercom or three hundred hours of standby facility which not very amazing. The pack provides additional headset clip with fastening screws and also adhesive airphone pads. 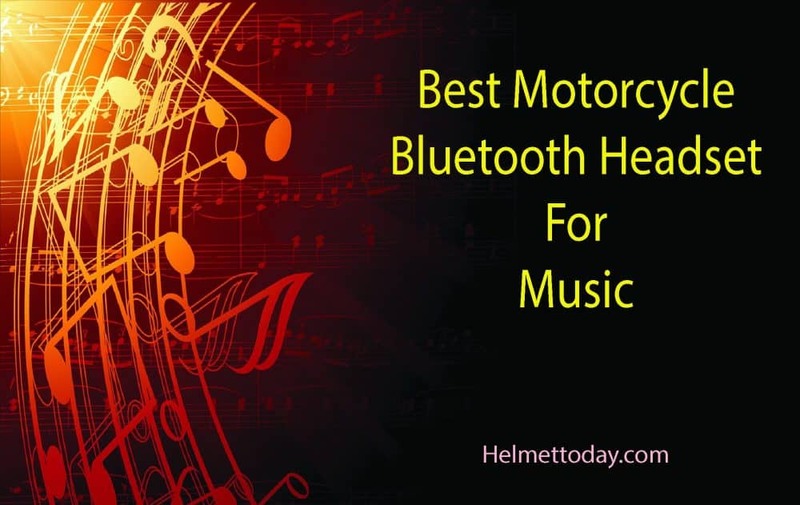 It is reasonable but on overall ranking, we can not brag it as a best motorcycle Bluetooth headset for Music. The name reflects the core feature in most cases. Here, the issue is the same. For the very first time connecting up to six riders through intercom had only become possible with V6. 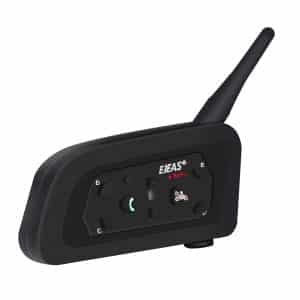 Prominent technology manufacturer EJEAS proudly presents V6 Pro series where you can connect up to six of your partners while riding. Not only that, you can create a host and five other partners can be connected via submachine. After forming the group host can be shifted and simultaneously two riders can talk. To get all these magical features just order V6 pro series. To solve the common, complain of battery life, the company launched 850mAh Polymer Lithium-Ion rechargeable battery which charges completely in 3.5 hours. This extended battery life allows you to do intercom up to 12 hours. Isn’t that amazing? In V6 pro series, standby time is increased up to 50% than previously launched VnetPhone.In super speed and heavy wind, you might face extra noise that interrupts the connection. This headphone introduces DSP Noise cancellation technology. Both incoming and outgoing calls will be as smooth as next-door calls. Hands-free phone usage, ultra-quality music and prolong talk time is common features. IP65 graded water resistance will assure the safety of the device and complete performance underwater. It suits all weather including scorching sunny day. This dustproof device is an ultimate choice BMX rider. The highly developed intercom feature allows you to connect anyone having Bluetooth device with the phone or even if with just GPS or mp3. Within 1200m of distance, you can contact clearly and speed up you wheel up to 120Km/hour. It can automatically switch between the call to music and in between intercom as well. You can connect your phone or even a stereo device with this device if the other device is enabled with Bluetooth. Although the Bluetooth version 3.0, it includes EDR. In extreme weather like -300C to +600C, you can use this device conveniently. For me, it is one of the best motorcycle Bluetooth headset for music & also in other use. Unlike the first two product LEIWOOR launched Bluetooth speaker for the helmet. The stereo audio allows you on handsfree calling and many other features. The silicone-based material makes the product durable and looks completely different from others. Although we found the device a bit weighty, around 60gm. 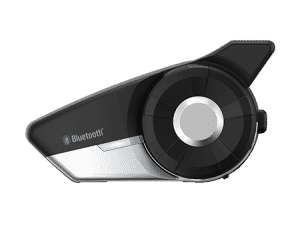 Bluetooth devices can be connected from a distance of around 10meter. The rechargeable battery of Lithium Polymer Ion battery with a capacity of 400mAh is not very high in definition but averagely okay. It is also waterproof and complies IP54. The 3-Watt speaker provides you crystal clear volume and assures quality music. The extreme temperature like 550C is also comfortable for this device. It also works in a chilly environment like as -200C. With a complete box, you will receive a wireless speaker and a Velcro with a 3-meter sticker. The best feature of this product is, it is highly compatible with a number of devices from the different platforms of the operating system. It is compatible with Android and iPhone as well. 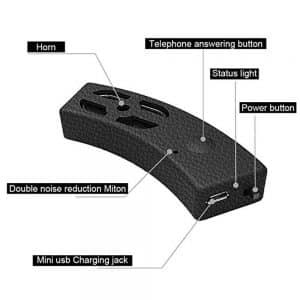 To ensure premium quality phone calls, a double layered noise reduction type microphone is installed inside. According to user review, while you shield up on the helmet; the sound quality is medium. But you can hear all sounds completely even on highways. In the shielded position, the output quality is best. It can also automatically answer your phone call in 3 seconds. Very convenient to use while using through the helmet. All you need to do is plug & Play. Despite all these features, we found the product is quite light in weight. It only weighs 2.88 ounces. A battery quality is extremely good. After a full electric charge, around 80 hours can be optimum. It also has a status indicating light to let you the device status. It has mini USB charging port and telephone answering buttons are placed. A unique headphone system that acts as a great intercom. It allows two speakers to talk simultaneously. You will be able to connect up to 3 riders and enjoy highspeed riding together. Imagine you are riding at a speed of around 120km per hour and having no interruption communicating your fellow riders. Yes, that is completely possible with Veetop. Even if you are 1000m away, the call quality will be crystal clear. The device is totally compatible with a motorcycle, snowmobile, and Ski as well. Stereo music or FM radio, no long ride can stop you from getting entertained. 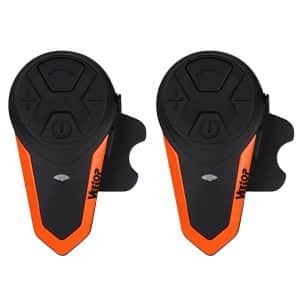 That’s why manufacturer claims it as best Motorcycle Bluetooth headset for musicYou can use GPS for navigation and call your loved ones in hands-free mode. This gives extra safety while riding. The Bluetooth version is 3.0 but the device also has an audio socket any wired connection lover. Anyway, for maintaining a backup communication channel, you have to give an extra mark to this device from the competitors. Even if for connecting tablet PC, phone or GPS a cable of 2.5.mm to 3.5mm is also provided with the pouch. The professional & unique design also keeps you safe in rainy days. Advanced noise reducing technology will take care of bikes roar and other roadside noises. With two Lithium Polymer batteries, you will get around 10 hours of talk time durability and 8 hours of nonstop music, Veetop gives you the best shot at the lowest price. Amazingly long standby time allows you to keep awake for 300 hours. Although the AC adapter is not added which is a disadvantage for the model. But easy installation technique allows you to use both open face or shielded face helmets. The device is also light and user-friendly. It weighs only 11.2 ounces. Reaching a verdict through a lot of catchy gadget is not an easy task. Hence, we have already seen the top five models for Bluetooth headphone mostly fit for motorcycle riders. This is the time to judge the best motorcycle Bluetooth headset for music. From the top, if we start with Q-Solo, genuinely it is one of the trendiest models with all common options for any random user. Hands-free phone call options, GPS, built-in FM, extraordinary audio quality and many more techno-based services are available. The model Srqs0002 has a unique option to use your voice command for receiving and using any options of headphone and mobile as well. Parallel hearing of audio streaming and GPS guideline is also possible in this product. T-COMVB Helmet Bluetooth Headset by Freedconn has effortless intercom feature where riders can talk within the distance of 800m and even in a speed 120Km/hour. Along with all common features like handsfree phone, Bluetooth based GPS, sun proof and dust proof facility we did not find this product very catchy for tech lovers. The Bluetooth version is 3.0 with no android or iPhone app support. Rather than V6 Pro has found to be unique. It introduced intercom service up to six riders within 1200 along with host and guest service even at the speed of 120Km/hour. The longest battery life along with 850mAh Polymer Lithium-Ion rechargeable battery gives you at least 12 hours of intercom through Bluetooth & EDR. Even in extreme weather range like (-300C to +600C), it works smoothly. In comparison to V6 Pro, LEIWOOR is average in use. With 400mAh battery all services are of average quality but compare to the features, the price is good. Our final reviewed product, Veetop 1000M can connect up to 3 riders within 1000m of distance and in 120Km/hour speed. Totally multiple vehicle useable device has an audio socket as well. With two Lithium Polymer batteries, you can enjoy music up to 8 hours. If you like technology with classical wired connection Veetop 1000M can be the ultimate choice. So, Dear friends and fellow, hope you loved this article. Enjoy your ride with the most suitable headphone for you. We strongly recommend V6 Pro and if you tell me to take the next choice, I will go for V100M. From our analysis, user review and cost budget calculations both of these models are the best motorcycle Bluetooth headset for Music. With all latest tech, design and weight both of them are a great choice and completely available in any local shops and online as well.